Please bear in mind that the Back-up-DVD of the “Adorage All-in-one package (Volume 1 to12)” is a Dual-Layer-DVD. Therefore, your DVD drive should be able to read Dual-Layer-DVDs. There is a Basic Version Adorage 12, which should be installed first. After doing so, check which editing software (NLE) you are using. If you are using a 32bit editing software, install the 32bit-Plugin Service Package (included in the delivery). Note:The selection of the Plugin does not depend on the Windows-version you are using. 2. If you are using a 64bit editing software (eg. 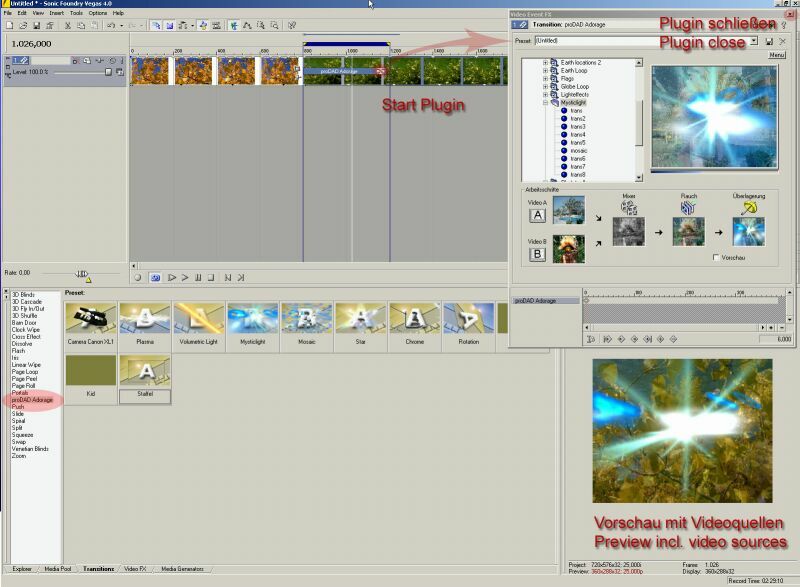 Premiere CS5, Sony Vegas 64bit 9/10 Pro), install the 64bit Plugin Service Package (included in the delivery). The current Adorage 12 or the Service Packages install new Plugins, i.e. the existing Adorage-Plugin will be refreshed. Please install the basic version of Adorage 12 first, then the new volume 12 will be included into the list of the opened Adorage (directly in Studio). Immediately after doing so, you can use all the Adorage effects and transitions. In case that previously installed earlier Adorage volumes (1-11) are already unlocked, the new Volume 12 will be activated. There is no need of any further unlocking on the part of Pinnacle/Avid. If you install your Adorage Volumes 1-12 newly we recommend to first uninstall Adorage completely. Then (re-)install your Volumes in order. Install the respective Service Package always at the end – either the 32bit- or the 64bit Service Package (or the two of them), depending on the editing software you are using. The 64bit Service Package will be installed only if you are using a 64bit editing software (currently in Premiere CS5 and Vegas 9/10 Pro). If you install older Adorage Volumes in addition to previously installed Volumes you should always install the current Service Package at the end - either the 32bit- or the 64bit Service Package (or the two of them), depending on the editing software you are using. 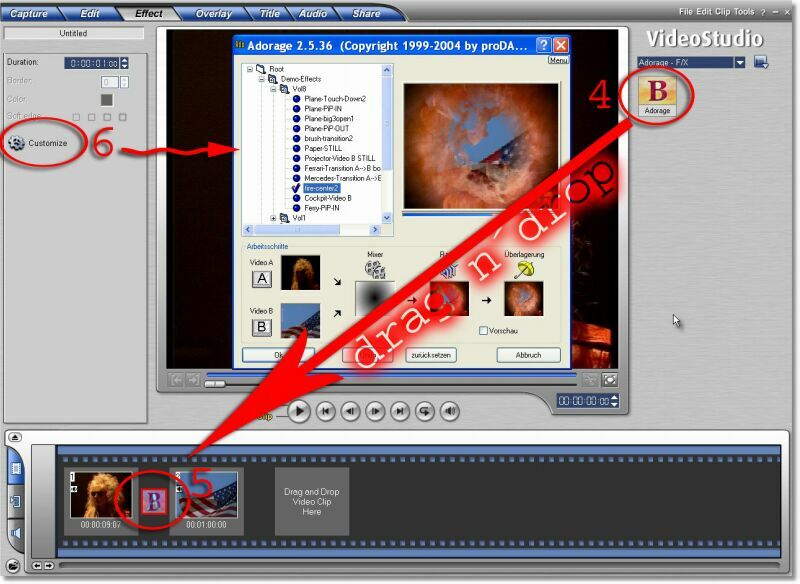 Installation of the Adorage 10 trial version or an Adorage 10 Servicepack may affect existing installations of one or more older full version effect packages. It may happen that an installed full version will revert back into demo mode again. This is due to a change in the licensing system this situation can´t being avoided because we are merging 2 licensing systems overlapping by two generations in one only installation. The big advantage is, that you don´t need to register online anymore. b) If you plan to purchase Adorage 10, this will automatically convert your other Adorage packages into full versions again. This means you don´t have to uninstall your existing Adorage series and reinstall everything. Using of older Adorage effects on Windows-Vista. Install the Tool (Link #1). After this, if not all effects listed install the effect volumes again. And install the latest Service (Link #2). 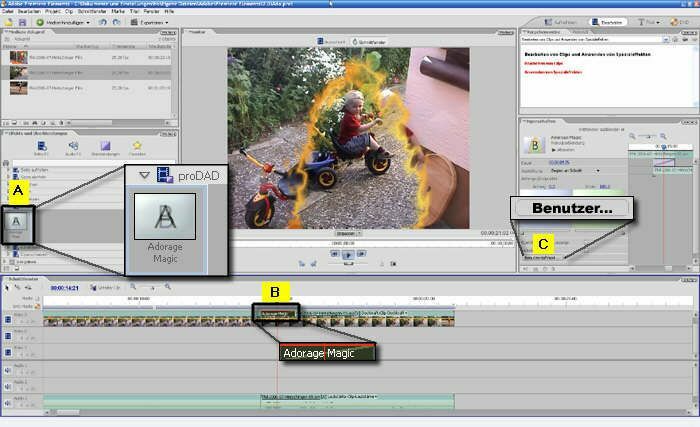 There is only one Adorage effect entry in the editing-software (NLE). But where are all the other effect templates from installed effectpackages or from the demoversion? During the installation process only one Adorage plugin has been installed - due to maximum overview within the effectlist of your NLE. This plugin finally shows the real effectlist. Just assign the Adorage-Plugin from the Transitions-list of your NLE between 2 scenes in the timeline - in the same way how you already know it from the NLE-own transitions. In its options you may find a button such as "Options", "Custom" etc. 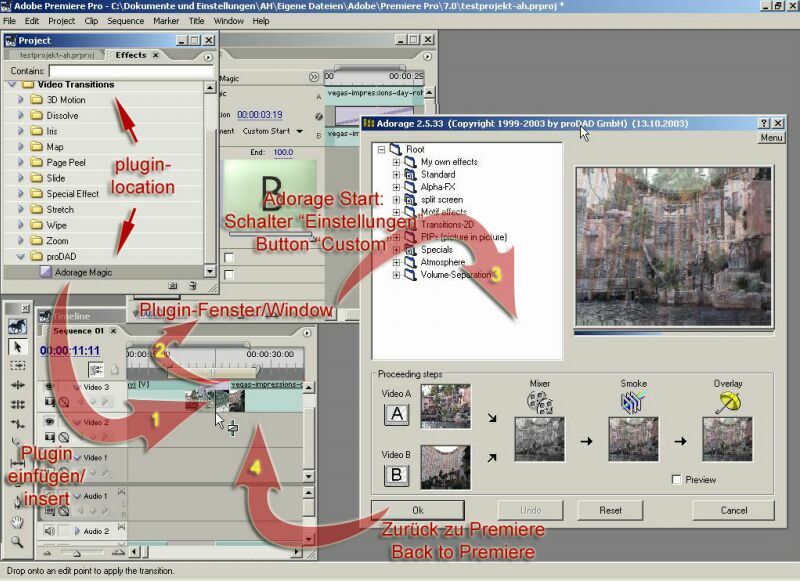 Klick it and the Adorage-Window appears and with it the extensive effectlist - depending on the number of installed effectpackages. Some NLEs also offers the Transition-Options with a double click on the Plugin symbol which has bees assigned in the timeline. 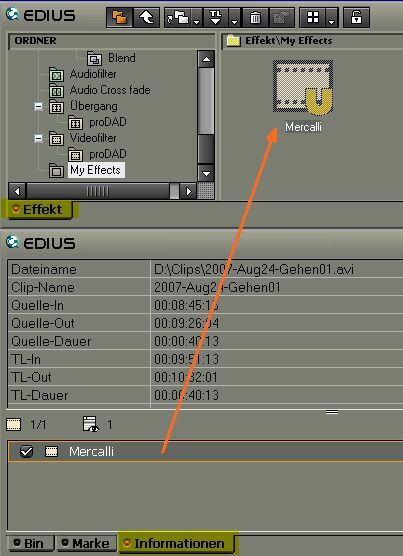 The Adorage options (here the effectlist) can be accessed in the same way, as the usual options or customizing possibilities of effects which came with your NLE. How to create and use an Adorage-Transition in Premiere Elements or Pro. 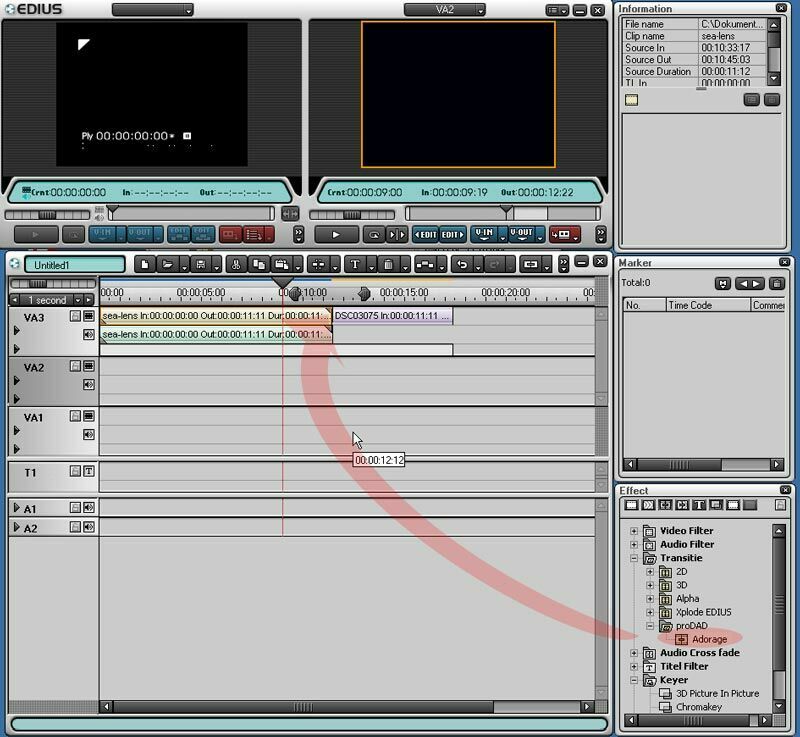 The assignment of the Adorage-Plugin as transition in the timeline generally happens exactly in the same way as with Premiere-own transitions. Once assigned as transition, press the "Custom..." button in the effect properties of Premiere to find the way to the huge Adorage effectlist with its thousands of presettings and all the Adorage-internal customization possibilities. Drag the Adorage item from the transition's list [A] to the timeline [B]. Drop Adorage between the overlapping area of the both clips (as you know from Premiere-internal transitions). After the effect is assigned, press "Custom" [C] to customize the effect and/or to get the effect list of the installed Adorage effect packages. Overlapping clips requires trimmed clips. Trim left clip at the right end and the right clip at its left start. Move the right clip to the left to create the overlapping area.